According to Adam Critchley, writer for Green Tech Media, the development of Mexico’s solar sector will likely mirror that of other markets, but with location-specific characteristics and some unique obstacles. As Mexico’s wholesale power market launches, a clearer roadmap of the country’s solar development is emerging. However, there are market headwinds, speakers and panelists at GTM Research’s Solar Summit in Mexico City agreed. Mexico’s solar growth is likely to mirror that of its northern neighbor and other developed countries, but with key differences. The country still faces obstacles that the U.S. and other markets have successfully overcome. And while important lessons can be learned from solar development elsewhere, Mexico faces some unique hurdles, summit attendees learned. Obstacles include a lack of awareness among potential customers of the benefits of switching to solar, a lack of capital among residents and access to financing for larger-scale projects, in addition to uncertainty as to how the nascent wholesale power market will play out. Mexico’s solar growth is likely to be slower than in the U.S., which increased from a cumulative 2 gigawatts in 2010 to around 26 gigawatts by the end of 2015, with Mexico’s installed capacity currently at less than 1 gigawatt and likely to only add around 2 to 3 gigawatts by 2020. On a comparative development timeline, Mexico is currently in 2004 in terms of U.S. installed capacity by that year, and is at the stage Germany was at 20 years ago, GTM Research’s Shayle Kann said during the summit. At that time in the U.S., the fastest growth in the country was the commercial PV market, which hit 203 megawatts by 2009. But in Mexico, utility-scale solar is expected to lead growth, at least during the next decade. Summit panelists identified policy and regulatory uncertainty as the biggest obstacles to the growth of utility-scale solar, followed by a lack of competitiveness and availability of capital. “Solar will have a hard time competing in Mexico over the next two or three years due to a lack of available capital,” according to panelist Pablo Otin, VP for emerging markets at 8minutenergy. Mexico’s wholesale power market, which launched in Baja California on January 27 and on January 29 nationwide, establishes the framework for greater private participation in generation, transmission and distribution. But in addition to the lingering regulatory uncertainty, the new market model is not seen as a level playing field, as it is dominated by state utility CFE. Ilioss CEO David Arelle likened participating in the Mexico market to playing soccer against the CFE, but in a match in which the utility fields 22 players, chooses the referee and ties the opposing players to the goalposts. As part of Mexico’s energy reform, the CFE is restructuring to form separate transmission, distribution, supply and generation subsidiaries, with the utility participating in the market as both a supplier and an offtaker. Arelle expressed his hope that Mexico’s solar energy association (Anes) and solar power association (Asolmex) would lobby for private firms and ensure that the energy regulatory commission (CRE), national energy control center (Cenace) and even the energy ministry (Sener) act as watchdogs to curb the CFE’s monopoly. Compared to the U.S., where residential solar has now topped 2 GW and seen four straight years of 50 percent growth, residential solar in Mexico is likely to see the slowest growth, panelists agreed. A month-on-month drop in electricity prices by the CFE throughout 2015 has removed residents’ incentive for switching to solar. In addition, the installation outlay surpasses the average annual electricity bill, making developers’ customer acquisition work that much harder. Residents are not yet convinced of the savings solar could offer, Rogelio Nochebuena, chief operating officer at renewables firm Servicios Ambientales de Baja California (SERAMBC), said during the summit. But as the market is deregulated and private firms bid for generation contracts in auctions, the first of which is slated for March 31, electricity prices are expected to rise, which will revive the incentive to convert to solar. Panelists cited increasing retail electricity prices as the biggest driver of solar growth in Mexico, followed by increased access to capital and a revised tender process, with resource-specific auctions. “Let solar compete against itself and not against other energy sources,” said Marco Garcia, chief commercial officer of California-based NEXTracker, which already builds components at its Mexico facility. The solar content of the first auction has yet to be revealed, but panelists predicted solar would make up around 10 percent of the total projects up for grabs. A lack of economic competitiveness was also cited as one of the biggest barriers to residential solar development in Mexico. But Mexico is also an attractive solar manufacturing market, according to GTM Research SVP Shayle Kann. 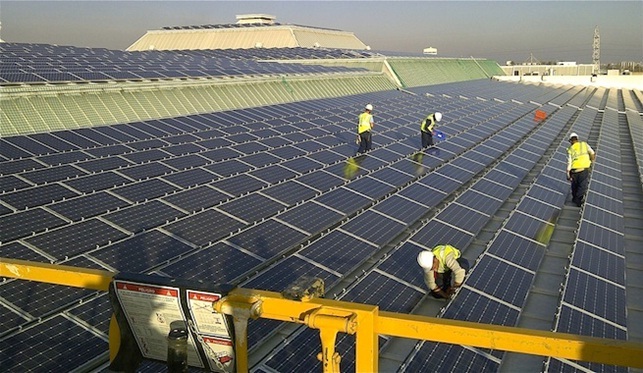 Solar component manufacturing is moving to domestic markets in other countries, and there is the potential for that to happen in Mexico, he said, citing the current 15 percent import tariff on panels as an incentive, in addition to Mexico’s proximity to the U.S., one of the world’s largest solar markets, which could become an export destination. “The country has enormous potential but lacks manufacturing clusters,” Nochebuena of SERAMBC said. Panelists dialed down their optimism regarding how big a market share domestic manufacturers could secure in the short term. “You can only build a certain number of factories in five years,” Otin of 8minutenergy said, predicting that the percentage of domestic manufacturing would remain well below 25 percent by 2020. Panelists were also conservative in their estimates of Mexico’s installed solar capacity by 2020, predicting that it is likely to total between 2 and 3 gigawatts. But the ambition exists to surpass that amount, and the government is committed to ironing out the issues concerning regulation that are currently causing a project bottleneck, according to GTM Research senior solar market analyst Mohit Anand. “Despite all the challenges, solar is poised to be a key player in Mexico,” he said.